When you’re securely employed by one of the most established companies in gaming, you might raise some eyebrows if you suggest jumping out of that safety net and into indie developing freefall. This was the first question I asked of Julian Trutmann and Nick Cooper, who left their positions at Epic Games to develop Soundfall as Drastic Games. 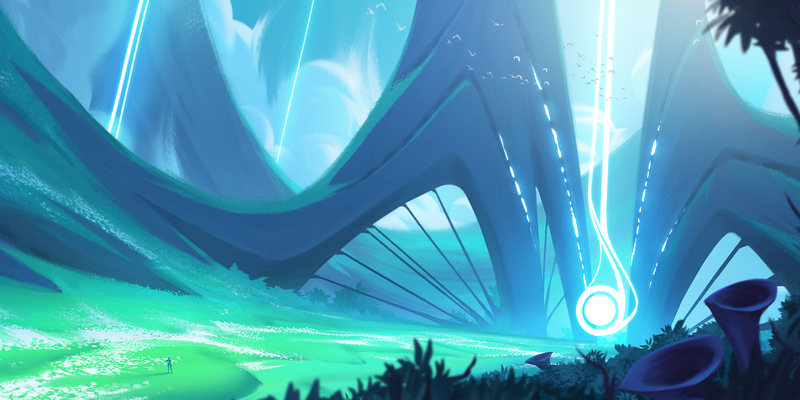 Soundfall is a vibrant and stunning game built on the backbone of Unreal Engine 4. 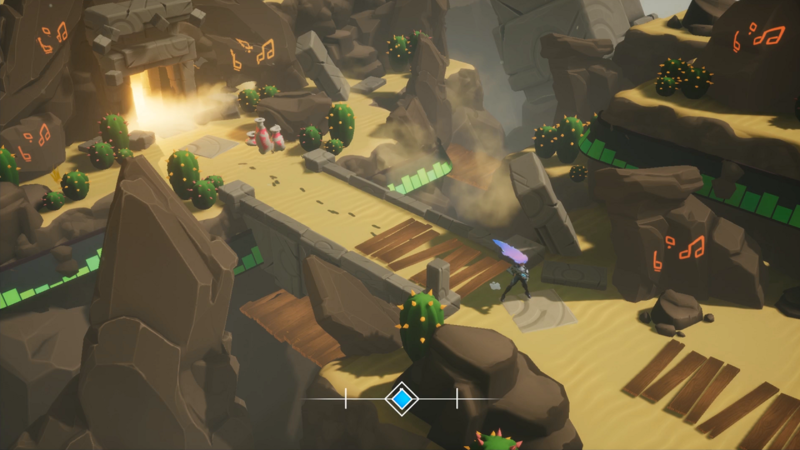 Leaning on their experience with the engine, Drastic is creating a fast-moving action game that takes the player’s own music and sets it as the soundtrack and tempo to their adventure. Syncing bass beats with gratifying gunplay isn’t a feat easily achieved, however, so Drastic had to go to considerable lengths to make it all work. Debuting their game on August 7, 2018, the reaction was swift and supportive. Soundfall had people intrigued and even Drastic themselves were not prepared for how well the game would be received. Now, with a number of appearances under their belts (PAX West, EGLX, and more), they’ve launched the game into crowdfunding on Fig and successfully smashed their goal within 24 hours. With plenty more time to go, the Soundfall team has set its sights on its many stretch goals. 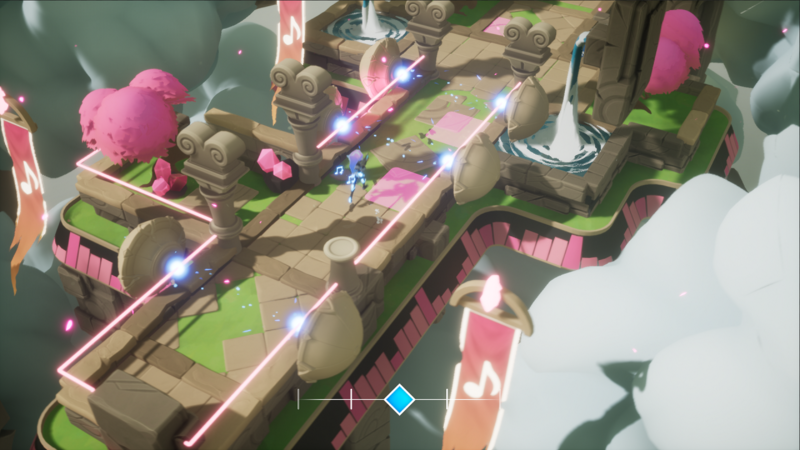 We took a moment to chat with one half of the Drastic Games team, Julian Trutmann, about the perils of going indie, the passion of creating something you love, and the power of Unreal Engine. Drastic Games is a small studio made up of two people who both came from the fold of Epic Games itself. What motivated you to pursue indie development? Over the course of our years at Epic, both of us were lucky enough to be a part of the small initial teams on several projects, such as Fortnite and Paragon. We were repeatedly blown away by what a small, talented, coordinated, and focused team could accomplish in a short amount of time. This got us wondering what we could do with a small team of our own and wanting to explore pushing the limits of small team game development. 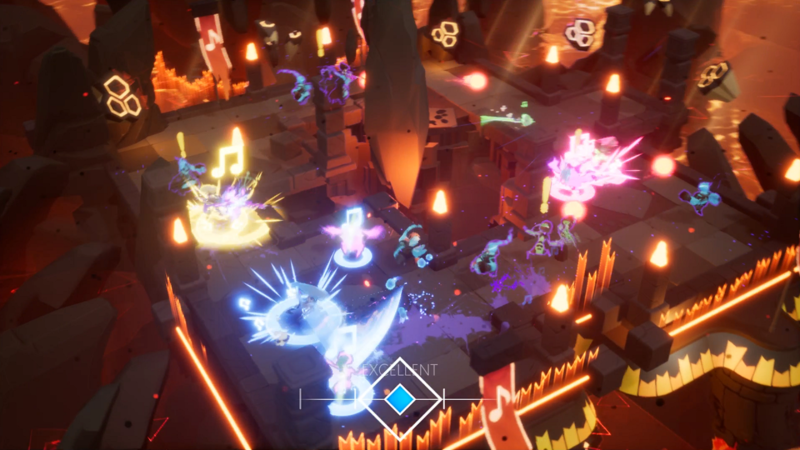 Soundfall is a fast-paced blending of action/adventure with a rhythm game, unlike anything we've seen before. How did you come up with the idea for the game? Our initial plan was to brainstorm and game jam a simple concept that we could execute in six months. Obviously, our plans changed! A few ideas we had floating around included a simple rhythm game and an Ikaruga/Gradius-style space shooter. At the time, we had recently played Audioshield, so the idea of a procedural rhythm game was also fresh in our minds. The music element stuck, and the shooter element evolved to be twin-stick since the versatility would allow us to use the systems we developed in a variety of possible projects. We moved forward with these elements and did a game jam over the course of a long weekend to see if they could mesh together in an interesting way. The result turned out way better than we expected! We knew we had something with incredible potential on our hands, and we didn’t want to waste it on a small quick project. From that game jam, we had the beginnings of what would eventually become Soundfall. Obviously, coming from Epic you have a strong grasp of the Unreal Engine, so what can you say has been your greatest advantage coming into Soundfall with so much experience? Having a lot of experience in Unreal Engine gave us the courage to take on Soundfall’s riskier elements. Audio analysis is a good example. I’m not sure we would have even considered going down that road if we didn’t already know the tools inside and out. 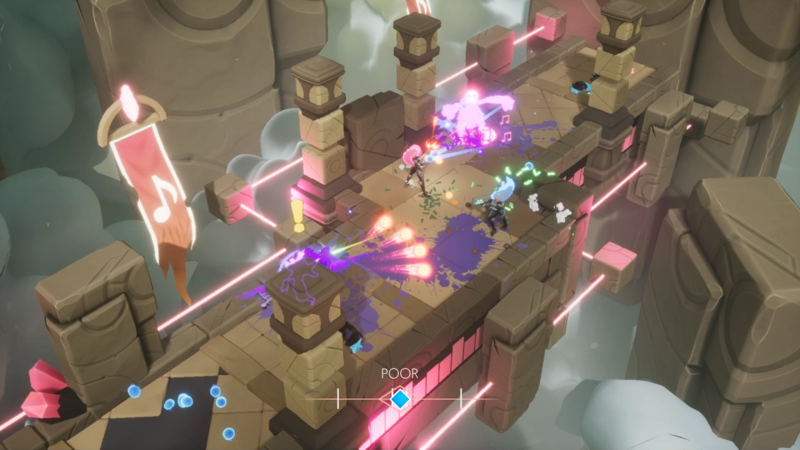 Knowing the engine also gave us the confidence to take on other features that we don’t see as often in similar indie games, such as online co-op. We haven't seen too much of the game just yet, but what we have seen is gorgeous. What's been your most vital Unreal Engine 4 tool bringing this vibrant world to life? There’s no one tool that takes the cake here. What’s made Unreal Engine 4 so powerful for us is how multifaceted its systems are. If we absolutely had to call out one tool, it’d probably be Blueprints. Basically, anything that reacts to the music in Soundfall is a Blueprint that’s responsible for coordinating some combination of other systems, like particles, materials, and animations. Ultimately, it’s using all these tools in concert that’s responsible for the vitality in our world. What have been the biggest challenges aligning rhythm alongside the fighting mechanics of an action game? Since Soundfall was designed to work with any song, the biggest initial technical challenge was getting the audio analysis up and running - in particular, beat detection. Initially, we spent a while developing some audio-analysis tools ourselves. We then discovered an audio-analysis library called Essentia, which we integrated to get a vast improvement on our beat detection, as well as a lot of other data about each song that we now use for our procedural dungeons and loot. Switching gears from thinking about all game actions in terms of “seconds,” to thinking about them in terms of “beats” was another major technical and design hurdle. Since we typically want actions to begin and/or end “on-beat,” there is never a simple, consistent conversion between seconds and beats. For instance, the number of milliseconds in a “one-beat” delay is going to differ based on if we’re asking right on the previous beat, or halfway to the next beat! This gets even more complicated when we consider tempo changes. As far as gameplay goes, just about all of our animations, abilities, and behavior trees needed to be authored in such a way that they are “beat-aware” — any portion that should be punchy or gameplay-relevant needed to occur exactly on-beat, and robust enough to work regardless of BPM and tempo changes. Obviously, a massive component of any rhythm game is the music! Have you guys composed the tracks yourself? Tell us about the creative process involved with bringing the sound alive in Soundfall! We’ve worked very closely with our audio engineer, Jens Kiilstofte, to shape the tone of Soundfall. In addition to all of the game’s folie art, Jens is responsible for the killer track on our trailer. On the music side, we all wanted Soundfall to work with lots of different kinds of music. 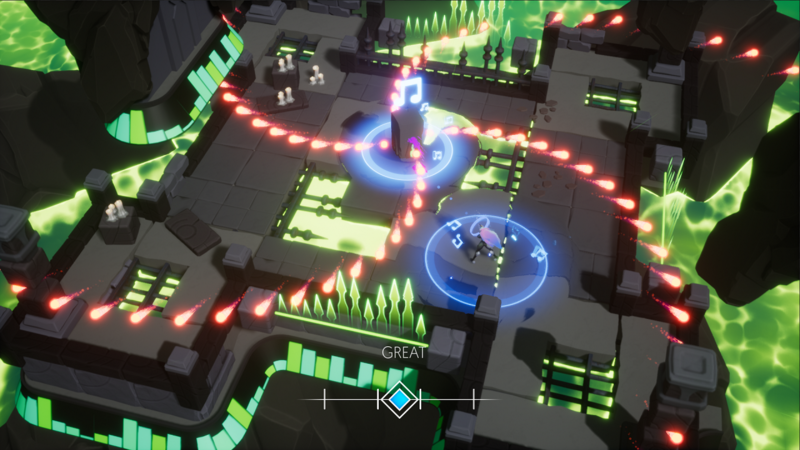 Even within the team, we all have very divergent tastes in music and we think that half the fun of Soundfall will be seeing how the game reacts to different songs. When it comes to sound effects, striking a balance between musical and impactful has been challenging. If weapons (like Melody’s sword and beat blaster) sound too melodic, they’re often unsatisfying to use. On the flip side, more traditional video game sword and gun sounds don’t really synergize well with the music, or add to the world’s ambiance. From what we've seen in Soundfall's reveal trailer, the world isn't only stunning but is brimming with life and movement! What are the hurdles that present themselves when adding so many moving pieces to your levels? On top of all the rhythm-based gameplay challenges we talked about before — performance! This has been particularly important to us, since traditionally in both rhythm and twin-stick games, players want the action to feel fast and smooth at all times. In typical games, most objects in the world are static, but in Soundfall, just about every actor in the world is animating or moving to the music. One of our saving graces is that our top-down camera helps give us a reasonable limit to how many of these moving actors are going to be visible at a time, so we can be smart about which actors we need to be ticking, animating, and sending “beat” events to. When a lot of slow operations occur in a single frame of a game, that frame will take longer, causing players to experience a hitch. In normal game development, we often try to distribute expensive tasks over several frames to avoid this as much as possible. Unfortunately for us in Soundfall, having most of our big actions occur on-beat means we end up forced to have a LOT of instances of many expensive operations happening at the same time! The game would be essentially unplayable if it was hitching on every beat when we expect players to perform their most important actions. We’ve had to be very smart about how much we are doing on-beat, and what operations can be moved to occur off-beat, in order to prevent hitching. Soundfall still has a long way to go before it's released, so it's safe to say you have a lot of development time in front of you. How does Unreal Engine 4 help you streamline and save time on complicated processes? First off, being able to get the initial game prototype up and running very quickly was very streamlined with Unreal Engine 4. Being able to quickly get an answer to our question “will a mix of rhythm and top-down action actually be compelling?” was crucial to deciding to go down this path. So many complex systems we needed just immediately work out of the box with Unreal — physics, networking, and navmesh, just to name a few. Blueprints and behavior trees continue to make gameplay iteration very quick and allow us to easily make new music-reactive actors. Based on your experience, what advice would you give to aspiring developers just starting to learn Unreal Engine 4? Start very small, learning one system at a time and by modifying existing examples. Re-creating an existing simple game, an 80s arcade game perhaps, is a great way to learn and will help anyone gain an understanding of how every system and discipline work together. Definitely don’t dive straight into trying to make a 100-player shooter or MMO! Where are all the places people can go to stay up-to-date on Drastic Games and Soundfall? People can check out more info about Soundfall or sign up for our newsletter at www.soundfallgame.com. We’re also currently running a crowdfunding campaign on Fig, where people can pledge or invest to become more involved with development and share in our future success!